Many thanks to Eddie and Graeme for arranging the perfect family Scottish golf vacation for Linda, John Peter and I. The courses were suberb and accomdations excellent. Really can’t say enough about how well things went. 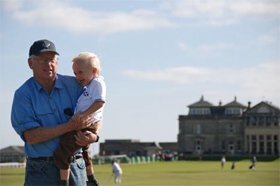 And John Peter asks not infrequently, ‘Dad, when do we go back to Scotland for golf.’ Thanks once again for making our trip a great experience.